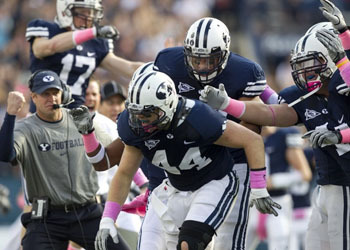 In my predictions, I’m often wrong, and sometimes I look downright foolish (see BYU @ Utah St. Preview). Today, I may stand alone again, but I called the game exactly. That’s a first for this blog, and I don’t mind enjoying it. As I mentioned in the preview, 24 points is the highest offensive output for the Cougars this season, and holding SDSU to only 21, well, that was the second best defensive effort, measured by points. Yes, the Cougars are 2-4, but a happy 2-4, that seems a world away from 1-5. San Diego State had one last opportunity to kick the Cougars on their way out the conference door. They are one of the schools in the Mountain West conference that has indicated that they do not want to play BYU as an independent. Saturdays loss to the down but-not-necessarily-out Cougars may give you a glimpse into why the Aztecs don’t want to play them in the future. So, with a second W in hand, let’s take a look at the keys to the game, and see what worked for BYU. The Rush Attack. Wow. BYU put together a run game that dominated SDSU from start to finish, putting up 271 yards rushing, and allowing BYU to possess the ball for 45:01 – yes, for three entire quarters, the BYU offense had the ball. It seemed that each and every snap was delayed until the last few seconds of play clock. Bronco’s strategy to keep the ball away from the Aztecs worked. DiLuigi and Kariya each ran the ball 22 times, DiLuigi for 134 yards, and Kariya for 85. It was a remarkable performance, and a lot of credit must be given to the O-line for making it happen. Jake Heaps and the Receivers. Heaps had a good day – he was 15/22 for 126 yards. That’s well above his usual 50% completion rate, and I think the run focus really helped alleviate some of the pressure that he was under. Instead of heaps having 50+ attempts, that burden was on the runningbacks, and Heaps was able to settle his nerves a bit. While he did throw a pick, I believe that overall his decision making has generally been good. His receivers only dropped a couple of passes this game, though I do remember seeing the ball hit at least two of them in the hands before falling to the ground. Team Identity. This team took a giant leap forward this week, with Coach Mendenhall taking over the defense, and in so doing, taking over the battle for team identity. This team fought with purpose and with emotion through the entire game, and I’m glad that the team was able to see some immediate results for all of their hard work by getting the W.
It’s all about the D. Bronco was wrong. We were able to see a difference in the play of the defense in week 1 of the New old Mendenhall system. Practices were longer and harder than ever in this season. Some referred to last week as a mini fall camp. Mendenhall works as hard or harder than the team he’s coaching, and they work harder as a result. In the first half, SDSU was held to -2 yards rushing, and to 53 in the game. Their high-powered offense only accounted for 273 yards. Granted, they did remarkably well for only possessing the ball for 15 minutes, but Bronco saw that coming, and adjusted the game plan accordingly. Even after the BYU game, SDSU averages 280 yards passing, and 180 rushing yards per game. The Bronco D simply took that away. It will likely be quite some time before the Aztecs will get another chance to face the Cougars, and without a conference affiliation, they may never play again. The Aztecs are now 3-2, heading into the bulk of their MWC schedule, which includes 3 ranked teams, including a matchup next week against #23 Air Force. The parallels with the 1993 season are scary. BYU had 4 straight losses, the last coming against Utah State. The win that broke the losing streak? Against San Diego State. There is one thing to be hopeful about the comparison though: the Cougars ended up 6-6 that year. With the win against SDSU, BYU can end the season at 6-6 and be bowl eligible, even with potential losses at ranked TCU and Utah. This was a great game, a statement game by BYU. Don’t count them out. The instant impact of Bronco taking over the defense was stunning. I am excited to see what this team looks like as the season progresses.